Charles Codman (1800 − September 11, 1842) was a noted American painter. Codman, who lived his entire life in Portland, Maine, was known for his landscape and marine paintings. Codman was apprenticed to the ornamental painter, John Ritto Penniman, where he began as a decorative painter with no formal training. He is classified as a limner. 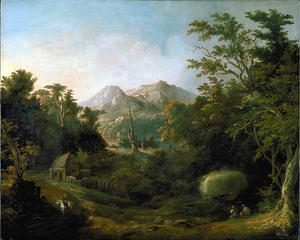 He eventually produced more mature works of romanticized landscape views. One of his more important commissions was to paint five fireboards (decorative panels placed over hearths during the summertime) in the landscape style for the Portland mansion of shipbuilder James Deering. He also filled commissions for both portraiture and decorative arts. His work was "discovered" in 1828 by the contemporary art critic, John Neal (1793–1876). Codman died on September 11, 1842 in Portland, Maine. He is buried in Eastern Cemetery. Today, Codman's work can be found in various museums and institutions such as the Museum of Fine Arts, Boston, the Brooklyn Museum, the Smithsonian American Art Museum.